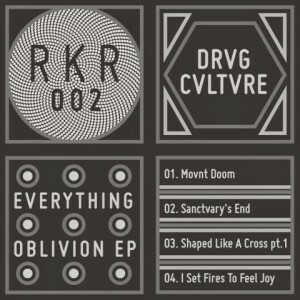 Dirty bass & electro cuts by Dutch producer Vincent Koreman aka Drvg Cvltvre who has considerably dropped the BPM rate compared to his RA-X years but not lost any intensity. Drvg Cvltvre’s coarse production style features rave-smelling hallucinating house keys in moderately paced cuts (“Movnt Doom”, “Shaped Like A Cross Pt. 1”) but any hopes for a slo-mo trip are ruined by “Sanctvary’s End”, a povnding monvnental cvt with svbtle EBM notes and also pyromaniac theme “I Set Fires To Feel Joy” kicks like hell. Transmitted from the digital imprint Radio Kobayashi the EP carries confusingly the same title as Drvg Cvltvre’s EP on Viewlexx in 2012 and also albums on Snug Life and Erikoisdance. It’s like calling your sons John, John and John – the name is the same but not quite the content. Waiting for the next “Everything Oblivion”.